^ Ioan James. Claude Elwood Shannon 30 April 1916 — 24 February 2001. Biographical Memoirs of Fellows of the Royal Society. 2009-12-01, 55: 257–265 [2018-04-02]. ISSN 0080-4606. doi:10.1098/rsbm.2009.0015 （英语）. ^ Bell Labs website: "For example, Claude Shannon, the father of Information Theory, had a passion..." 互联网档案馆的存檔，存档日期2011-06-05. ^ Poundstone, William. Fortune's Formula : The Untold Story of the Scientific Betting System That Beat the Casinos and Wall Street. Hill & Wang. 2005. ISBN 978-0-8090-4599-0. ^ Robert Price. Claude E. Shannon, an oral history. IEEE Global History Network. IEEE. 1982 [14 July 2011]. 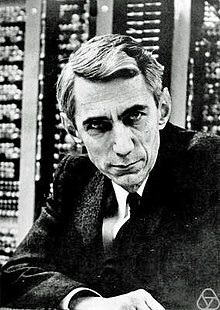 ^ Claude Shannon, "A Symbolic Analysis of Relay and Switching Circuits," 互联网档案馆的存檔，存档日期2012-09-16. unpublished MS Thesis, Massachusetts Institute of Technology, August 10, 1937. ^ David A. Mindell, Between Human and Machine: Feedback, Control, and Computing Before Cybernetics, (Baltimore: Johns Hopkins University Press), 2004, pp. 319-320. ISBN 978-0-8018-8057-5. 《保密系统通讯理论》（Communication Theory of Secrecy Systems）：Scanned JPEG images，PDF，PDF site.